"I went for my first visit this week. Dr. Marwaha was kind, gentle, and concerned." "The office has maintained a steady efficiency over these years." "Cautious and thoughtful with regards to his patients." 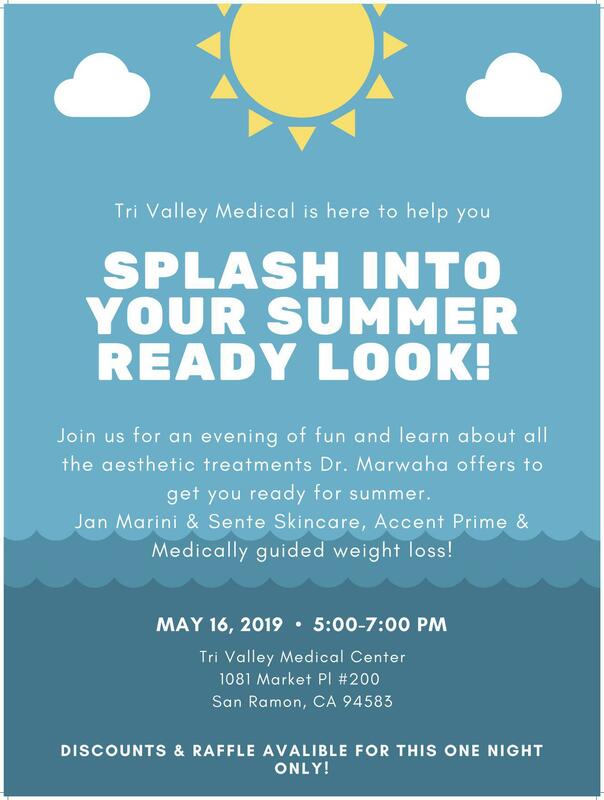 Tri-Valley Medical Center is an intimate, friendly, and comfortable health care clinic conveniently located in San Ramon, California. At Tri-Valley Medical Center, the experienced team focuses on listening to the men and women in their care because they understand that positive communication between a patient and their physician enhances a person’s overall wellness. Because of this, the medical team considers time to be the most crucial aspect of promoting health and well-being, and so never rush patient visits as they work to establish a relationship built on trust and understanding. In addition to providing a comprehensive array of medical services, including internal medicine, sleep medicine, podiatry, immigration physicals, and women’s health care, the Tri-Valley Medical Center team also provides medically supervised weight loss programs and aesthetic treatments, like body contouring and skin tightening. Men and women in San Ramon, Pleasanton, Dublin, Livermore, and Danville can rely on the Tri-Valley Medical Center team to guide and manage their care every step of the way. They offer weekend appointments, urgent care services, and have on-staff physicians at San Ramon Regional Medical Center. Clean Start Weight Loss Program Summary from IAPAM on Vimeo. For your convenience, Tri-Valley Medical Center accepts most major insurance plans! "He definitely takes the time to listen to his patients, never have I felt uncomfortable with his care. He strives to meet his patients needs." "Dr. Marwaha makes me feel at ease, with making me completely comfortable and always making me laugh. I have nothing but good experience when I go." "I have been going to Dr. Marwaha since I was a little girl and he has always given me his utmost attention. He and his staff listen, they're detail oriented." "This is an excellent practitioner. For an intelligent patient it doesn't get any better than this doctor."